For those of you who are yet to be in the know, it is my distinct privilege to be married to the wonderful and talented Marie Anne Chiment. Among the many benefits that thereby accrue, I get to regularly jet off to far flung locales in order to squire my lovely lady to her latest openings. 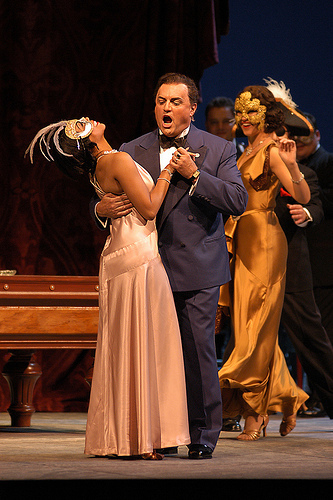 This week, we’ll be attending the re-mount of Rigoletto, a show that she originally designed for the Seattle Opera in 2004. Happily, Seattle Opera’s General Director Speight Jenkins liked the original so much that he decided to include the production in his “farewell” season. Even better, the opera was directed by Linda Brovsky, an exceptionally talented director and dear friend. Linda was our Maid of Honor, so you might imagine that we get to see her in person all the time, but given her world-trotting schedule, we have few such opportunities. It’ll be a treat to see her in person. Be sure to check out Marie’s Portfolio site (http://chiment.com) for a ton of Rigoletto renderings and production photos.